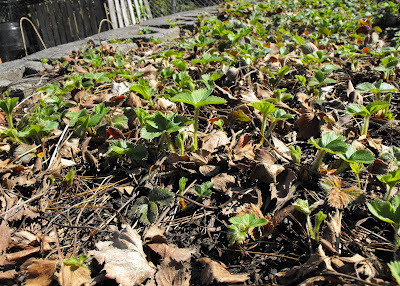 One of my favorite spring garden tasks is to clean out my strawberry beds to prep them for a successful summer harvest. I'll admit, I'm rather vicious as I clean out those beds. But, there is a method to my madness. My goal is to create space between the established plants and clip off the runners so that the parent plant will focus it's energy on producing big berries. With my clippers in hand, I cut the runners and tear out old leaves and stems. 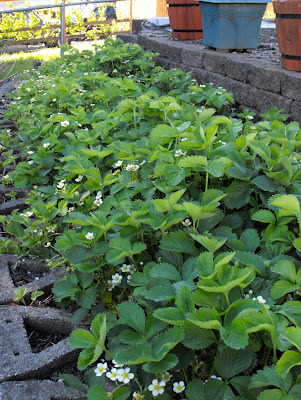 In the past, I have used the 'baby' runners to expand my strawberry bed and I would plant them in the unused space. This year, I'm full. I've gone from six plants 5 years ago, to a full 4' x 15' bed. Using the runners (baby strawberries) is a frugal way to expand your strawberry beds. Strawberries more cleaned out with space between the plants. Creating space between the strawberry plants is important because if I left all the matted and dead material, it would be a haven for nasty slugs to hide. Once I've cleaned out the beds, I sprinkle homemade compost around all of the plants. I tried this last year for the first time and I could not believe the bumper crop of berries I grew! Over 75 lbs from my one little patch. We have been enjoying homemade smoothies all winter from my frozen berries. 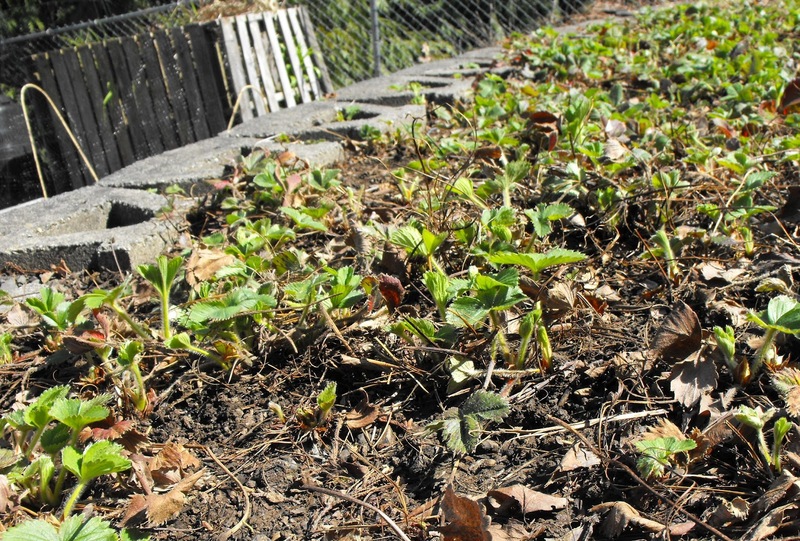 Here in the Pacific Northwest, growing strawberries is relatively easy. Our cooler springs are favored by berries, allowing them to set well. Despite the long, cold, spring last year, local strawberry growers found themselves with a wonderful harvest by late June - early July. I've learned it's important to plant berries in well draining soil and if you can, plant them on little mounded hills. My berry bed is planted in a rocky soil mix; a terraced area that wasn't really designed to grow anything. Drainage is not an issue here ;) Adding compost and then fertilizing through out the growing season will give you an excellent chance at a bumper crop. Here's a link the homemade organic fertilizer I've used with great results on all of my flowering veggies and berries. I'm hoping this year will be another Summer of Strawberries. I just planted new strawberry bed this week...from my neighbor's runners! I can't wait until next spring when I get (hopefully) a good crop of delicious berries! Fresh berries are soooo good! Alica, if any of your strawberries flower this year, pluck them off. It will help the plant to focus on growing to give you better berries next year. Homemade compost is the best, I also make my own and the rewards are awesome! I think we could well end up with a second strawberry bed this year! Are you going to take runners off for your new garden? Hi Sue, That is my plan. Unfortunately, due to health related issues in our family, new garden beds at the new house have not been built and won't be until late summer. I'm hopeful that I can salvage some late season runners and get the beds started then. We will be putting some fertiliser on the new bed before planting either chicken manure pellets or fish blood and bone. The existing bed will get a dressing of fish blood and bone between the strawberries and tickled into the soil. If you pot up runners this season you can plant them around this time next year. Ours have overwintered in the cold frame and are fine. What kind of strawberries do you have? 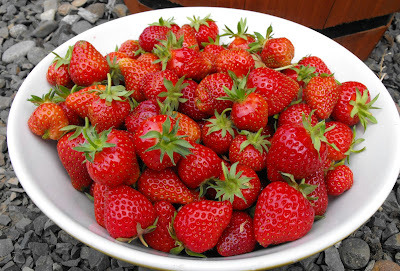 There are about 700 different kinds and they all promise the best berries, but your look delicious! Oh, and thanks for the tip on the flowers, I'll make sure I do that this year. IG - I've used Ever-Bearing. They have given me a strong late June harvest and then a trickle through out July. Hoods are also a favorite in these parts too. Congrats on such a bountiful crop of strawberries last year. Let's hope this year is as good or better. Kudos to you on getting such a great strawberry crop. We love them here, I need to figure out a good spot to grow them. Some good tips here. I hope you can manage to grow some at your new place. Great job. It's sure to be a great strawberry season again this year. Thanks for the tip on cutting the runners, why in the world I hadn't thought of that I don't know. Wow, that's a lot of strawberries to eat, lucky you. It's the last year for my Sister and BIL to grow strawberries on their farm, we just made it up here in time. Great hints, I think I am going to start a little bed of them around the house, got it on my gardening list. Thank you. Now I'd like to eat my computer screen. :) That bowl of berries is making my stomach growl. Cleaning up my strawberry plants is definitely on my to-do list. Yours look wonderful. One of these days I need to start a strawberry bed! You've persuaded me! And grocery store strawberries have no flavour at all. Hi Kelli ~ no the grocery store offerings are a poor second to homegrown. You have perfect weather in N. Ireland for strawberries! What lovely strawberries you grew! I enjoyed reading about how you established your bed and how you take care of it. I am glad to hear that you were able to get such a nice sized patch from a few original plants. I have a friend who has given me some plants that I put in my garden across the street. They haven't done well, maybe because they are too close to trees. On a whim, I bought 4 to 6 plants at a garden center, and planted them under the bench in my front yard garden last year. They spread a little, and the original plants have a number of green strawberries on them. When they ripen, I hope I find them before the birds do. Hi Sue, are you fertilizing them? The first 2 years I did not fertilize my berries and when I started, there was a massive difference. Oh you do get a lot of berries. Uhm one of our dogs eats ours, even if we fence it in, he jumps it or something!!! Oh, my pooch would be in *SO* much trouble if he did that. No, I haven't fertilized the strawberries. I have some called Worm Poop. Maybe I can use that on them. They look pretty healthy, though. Ah yes, I just cleaned out my strawberry beds last month. I big CHORE! But so clean and fresh they are all tidied up. Cant wait to eat them this summer! Greens are good. They look so fresh. تعتبر ركن نجد افضل شركة تنظيف منازل بالرياض حيث تعتمد تقنيات التنظيف لدينا علي استخدام التقنية الحديثة متمثلة في استخدام ماكينات تنظيف الارضيات وكذلك احدث الات تنظيف واجهات المنازل و شركة تنظيف شقق بالرياض وماكينات جلي وتلميع حديثة بالاضافة الى مهارة وخبرة كبيرة لموظفي الشركة في تنظيف المنازل كافضل شركة تنظيف منازل بالرياض أذا كنتى تعانى من أعمال التنظيف االممله والصعبه فشركة ركن نجد توفر عليكى الوقت والمجهود حيث تقوم شركة تنظيف شقق بالرياض بتقديم الخدمه بجوده ودقه عاليه تعيد منزلك الى جماله مهما كان حجمه أو شكله .